Two of the world’s biggest nuclear-powered Navy vessels — battle cruiser «Pyotr Veliky» and Typhoon-class sub «Dmitry Donskoy», on Monday left Severomorsk. Next stop is St.Petersburg. The ships will have to make it the Kronstadt, the naval town near St.Petersburg, before 29th July when a grand celebration is planned in connection with the Russian Navy Day. The more than 24,000 ton Kirov-class battle cruiser «Pyotr Veliky» is the flagship of the Northern Fleet. The Typhoon-class sub «Dmitry Donskoy» is the biggest submarine on earth. 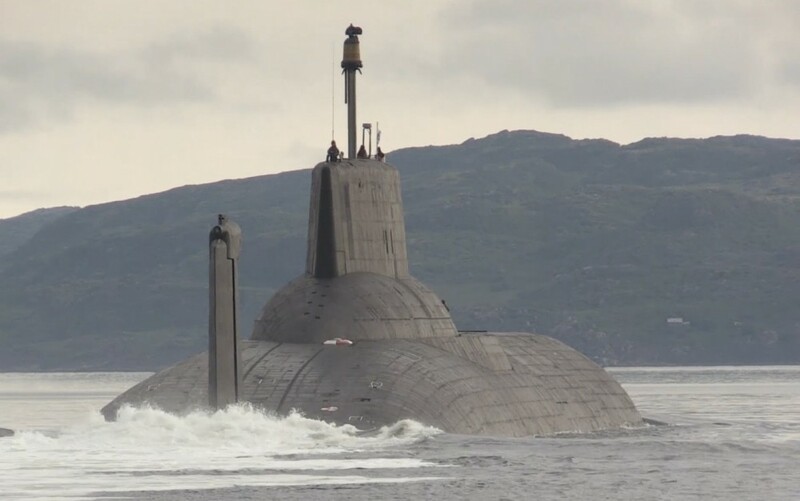 It will be the first time that a sub of this class will sail into the Baltic Sea. The crews of the ships have ahead of their departure conducted a full cycle of basic battle training and preparations, the Northern Fleet informs. The sailing course of the vessels is made in order to provide safe sailing through the Barents Sea, the Norwegian Sea, the North Sea and the Baltic Sea. Of special importance has been training on sailing through narrow straits, a press release reads. In addition to the «Pyotr Veliky» and «Dmitry Donskoy», the Northern Fleet will be represented in St. Petersburg with the «Marshal Ustinov» and the «Vice-Admiral Kulakov». At least another six Russian Navy vessels will attend, presumably all of them from the Baltic Fleet. Speculations have run high for several weeks about the time of departure of the vessels. It was previously believed that the submarine in late May left towards the Baltic. Due to her size, the Typhoon-class sub will have to sail in surface position through Storebælt, the strait between the two Danish islands of Fyn and Sjælland before entering into the Baltic Sea. Also, the Baltics are mostly shallow waters where a Typhoon submarine will have to be at the surface, at least for the most. Most of the voyage takes place outside the coast of Norway. Press spokesperson with the Joint Head Quarters, Major Brynjar Stordal, told the Barents Observer that it is natural to keep an eye on such voyage.